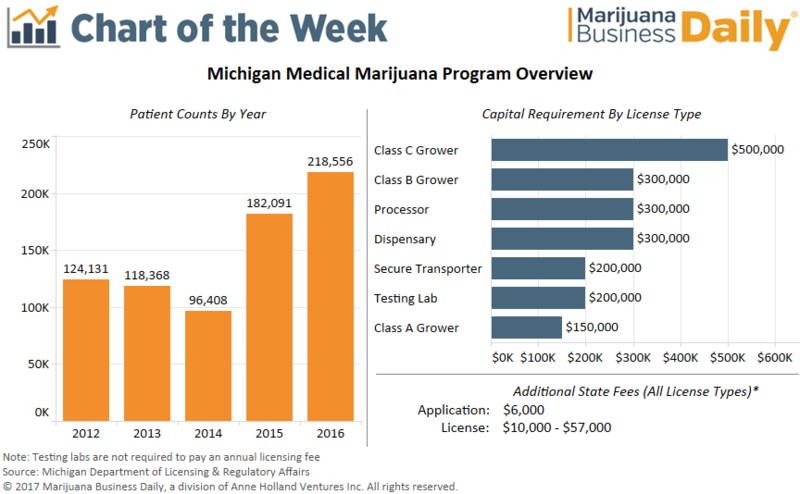 With applications released and emergency regulations in place, prospective entrepreneurs have begun applying for MMJ business licenses in Michigan – the second-largest MMJ market in the nation. Through a trio of bills passed in 2016, Michigan finally established a regulatory framework to govern its longstanding medical marijuana industry, which has existed under a patchwork of local regulations since a 2013 state Supreme Court ruling effectively banned MMJ dispensaries. Emergency regulations passed in early December allow the agency to begin accepting MMJ business applications in the interim. The temporary regulations will remain in place for six months. Entrepreneurs seeking to open an MMJ company face capital requirements – essentially proof that an applicant has adequate financial resources to cover the initial expenses of operating and maintaining a licensed business. Applicants must show that at least 25% of the assets used to meet these capital requirements are liquid and can be easily converted into cash. Capital requirements are a fairly common practice among states with MMJ industries. Businesses will be required to pay an annual license fee to operate in the state. The amount has not yet been set, because it will be based on the number of license applicants. The fee could be as low as $10,000 or as high as $57,000. Local municipalities may also establish an annual fee of up to $5,000 to defray administrative costs. California is the only state with a larger medical marijuana industry than Michigan’s. Previous crackdowns on Michigan’s MMJ program have caused patient counts to fluctuate, but now that the industry is on relatively stable footing, no further setbacks are expected. A 2016 estimate by the Michigan Senate Fiscal Agency suggests the state’s MMJ market could eventually eclipse $700 million in annual sales. The licensing board expects to issue MMJ business licenses in the first quarter of 2018, though sales would likely not begin until the second half of 2018.